The Ferrari 599XX Evolution is perhaps one of the most impressive track toys available. The original 599XX was built by Ferrari as a ‘rolling laboratory’ for developing future road cars and designed for track use only. A major upgrade for this non-homologated sports car was unveiled at the 2011 Bologna Motor Show, where the evolution package was shown for the first time. The 599XX Evo features improved chassis dynamics thanks to an active aerodynamic package ‒ from which the active rear wing is most noticeable ‒ integrated with the vehicles’ electronic control systems, and the adoption of new Pirelli tyres. Compared to the standard 599XX, the upgraded Prancing Horse weighs 35kg less and has slightly improved peak power of 750 horsepower. Thanks to these upgrades, the 599XX Evo is able to lap the Fiorano circuit in one minute and 15 seconds. To give you an impression, this is faster than the Ferrari FXX, and ten seconds faster than the Ferrari 599 GTO, Ferrari Enzo and Maserati MC12. 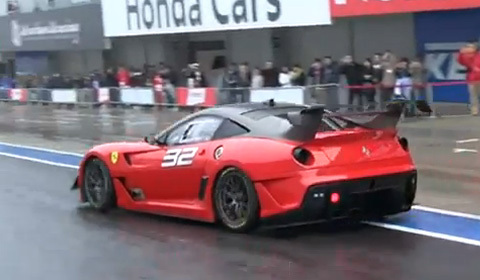 This video shows a few Ferrari 599XX Evolution’s hitting the track for the first time at a rainy Suzuka, Japan. Enjoy!